300 flights cancelled or delayed at Pearson as freezing rain hammers Toronto - Canada Eh? Freezing rain means a bad day for the TTC, but also for Toronto’s Pearson Airport. As ice pellets continues to plummet the city, around 300 flights have been cancelled or delayed at one of Canada’s largest airports. 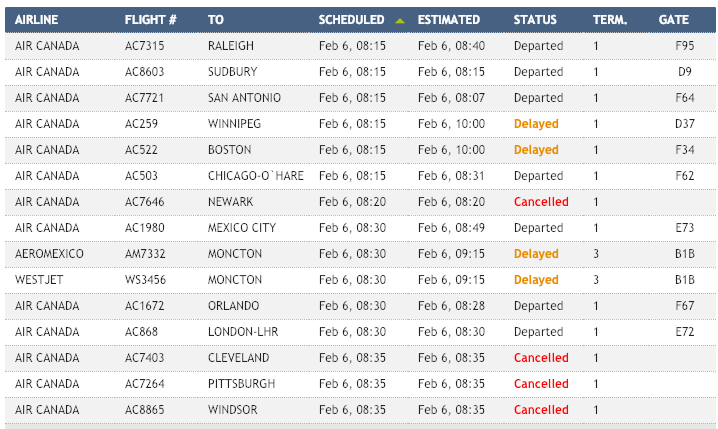 As of 9:30 am on Wednesday, Pearson Airport showed 151 cancelled arrival flights, and a 159 cancelled departures. Travellers who have flights booked out of Pearson today are advised to contact their airline and confirm their flight’s status before arriving at the airport. Environment Canada issued a freezing rain warning for the City of Toronto early Wednesday. Travellers should continue monitoring the airport throughout the day, as conditions are expected to change.